Washington, D.C. - The renovation of Bartholdi Park at the United States Botanic Garden (USBG) is complete, and the new garden is a showcase of sustainable gardening. Created in 1932, Bartholdi Park has served as a demonstration garden for more than 80 years and until 2016 had not undergone a complete renovation since its original construction. The renovation provided an opportunity to increase accessibility, showcase the Sustainable SITES Initiative (SITES) principles in action, and demonstrate USBG's commitment to sustainability. 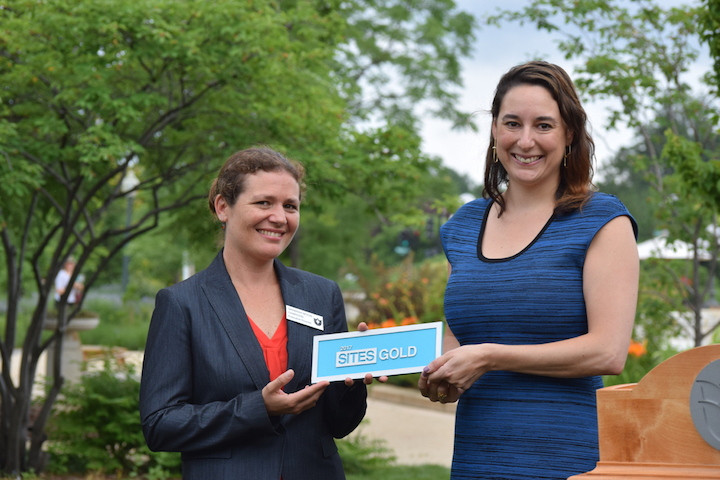 USBG and Green Business Certification Inc. (GBCI) are proud to announce that Bartholdi Park has achieved SITES Gold certification for its sustainability strategies, and is the first project in Washington, D.C., to be certified under SITES version 2. SITES is the most comprehensive system for designing, developing and maintaining sustainable land. It serves as a guide for sustainable landscaping and land development in a similar way to the U.S. Green Building Council's (USGBC) LEED green building program. The USBG led the development of SITES along with the Lady Bird Johnson Wildflower Center at the University of Texas at Austin and the American Society of Landscape Architects. "USBG has championed SITES since our initial work in helping develop the program more than a decade ago. 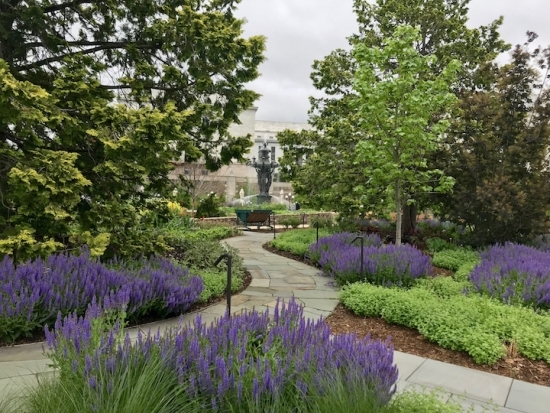 We are excited to now have Bartholdi Park as a living example of a sustainably designed garden right in the middle of Washington, D.C.," said Saharah Moon Chapotin, executive director, USBG. "This allows us to showcase how sustainable gardening can be beautiful as well as provide benefits for both humans and the environment." "Bartholdi Park's sustainable development serves as a model for communities looking to build a healthy and prosperous future for residents and visitors," said Mahesh Ramanujam, president and CEO, USGBC and GBCI. "Through the use of SITES, certified projects are creating ecologically resilient communities, reducing water demand, improving air quality and connecting people to nature. Bartholdi Park at the U.S. Botanic Garden is teaching us about the countless benefits we can achieve when sustainable strategies are applied to our landscapes." Water: Ten rain gardens capture 100 percent of rainfall on the site and allow it to soak into the ground, diverting runoff from D.C.'s combined sewer system. The rain gardens can accept up to 4,000 cubic feet of water in a 24-hour storm event - equivalent to 256 bathtubs of water. The project also used permeable paving and reduced the amount of impervious surface. Plants: The gardens in Bartholdi Park showcase plants native to the Mid-Atlantic region and a collection of edible plants in permanent and seasonal plantings in a new kitchen garden. The project team was able to save multiple large trees and shrubs on site; other plants were reused on Capitol Hill and in D.C. Public Schools. Soil: During the renovation, topsoil was removed and saved off-site, amended with organic compost and returned to the park for the new plantings. In areas where plants were saved, the soil was also protected from compaction. Materials: Existing concrete sidewalks were crushed and then used as the base layer under the new sidewalks. Previous stone walls were disassembled and their stones were reused in the new walls for the raised kitchen garden. Flagstone from previous pathways was also salvaged to create new paths. For the park's locally sourced furniture, a Virginia company built seating and tables from white oaks that had fallen naturally during a storm. Human Health: The park connects people to nature through programming that includes yoga and nature-in-motion walks. Additional seating, a water fountain, and bicycle parking were added. Tours and signage explain the sustainable features, providing inspiration for how to apply these principles at home. The creation of the American Veterans Disabled for Life Memorial next door to the park presented an opportunity to collaborate with the National Park Service, and educational and therapeutic programs for veterans and active duty soldiers were developed and now use this space. The story of the renovated Bartholdi Park is shared through new interpretive signage throughout the park. A new Field Journal, an interactive booklet for young visitors, was developed that focuses on the park's plants and sustainability. It can be picked up free-of-charge at the Conservatory's Information Desk. Tours of Bartholdi Park and other programming occurring there can be found at www.USBG.gov/Programs. GBCI is the premier organization independently recognizing excellence in green business industry performance and practice globally. Established in 2008, GBCI exclusively administers project certifications and professional credentials and certificates within the framework of the U.S. Green Building Council's Leadership in Energy and Environmental Design (LEED) green building rating systems, as well as the PEER standard for power systems, the WELL building standard, the Sustainable SITES Initiative (SITES), Parksmart, EDGE (Excellence in Design for Greater Efficiencies), TRUE Zero Waste certification, Investor Confidence Project (ICP) for energy efficiency retrofits and the GRESB benchmark, which is used by institutional investors to improve the sustainability performance of the global property sector. www.gbci.org.